After her much anticipated visit in Bulgaria in September 2012, which proved disappointing for Bulgaria's handful of remaining independent journalist, EU Digital Agenda Commissioner Nellie Kroes has sent a letter to Bulgarian Prime Minister Boyko Borisov urging him to protect media freedom. Kroes's letter – sent to Borisov on October 12, 2012 – was reported Wednesday by the Bulgarian weekly Capital. In the letter, Kroes, whose reaction to the massive manipulations in Bulgarian media seemed rather lackluster in September 2012, makes it clear once again that she is deeply concerned about media freedom in the country. "I really appreciate the fact that you spontaneously admitted that the situation with the transparency of media ownership in Bulgaria is unsatisfactory, and agreed with me about the need for an urgent reaction. I am impatient to learn what measures you and your government intend to undertake," the EU Commissioner writes in her letter to Borisov, according to the Capital weekly. She expresses her attachment to transparency and free market competition in all spheres especially when crucial values such as freedom are at stake. "I hereby urge you to undertake adequate measures so that you can guarantee to the Bulgarian citizens that they will be able to take advantage of the diverse and pluralistic media environment that they deserve," Kroes states. "I have my strong support, and I am ready to cooperate with you, should you decide to take advantage of my services," the EU Commissioner offers further. 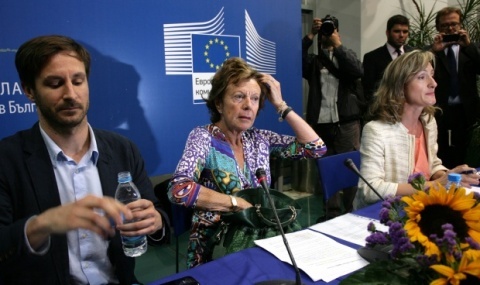 During her visit in Sofia in September 2012, EU Commissioner Neelie Kroes declared that Bulgarian media were "not sure" what media freedom was.